BOSTON—December 9—It’s official. 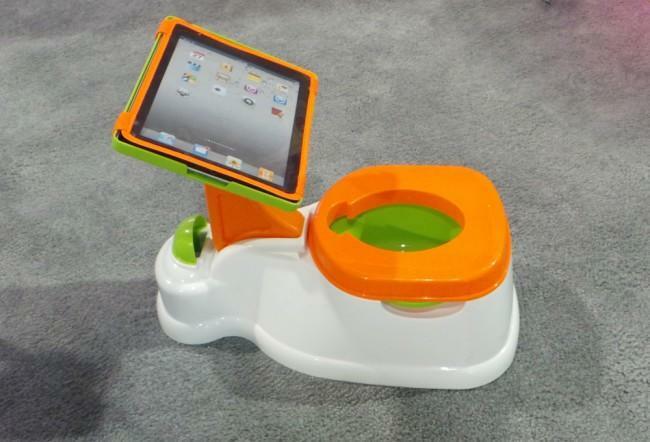 Fed up with the latest effort to insinuate screens into every nook and cranny of young children’s lives, members of Campaign for a Commercial-Free Childhood selected the 2-In-1 iPotty with Activity Seat for iPad by CTA Digital as winner of this year’s TOADY (Toys Oppressive And Destructive to Young children) Award for the Worst Toy of the Year. I’m not sure I’d agree with the idea that potty training is something with a social and or emotional focus. I’m reasonably certain that it’s something where we hope toddlers will learn a certain amount of social and emotional control instead. By combining the two pieces of technology it could therefore be possible to automate this most tiresome of child rearing tasks. Something that of course frees up that caregiver’s time to do something more interesting and or productive. It is, if you like, a part and parcel of that “washing machine” that Ha Joon Chang and Hans Rosling identify as being one of the most liberating technologies yet developed. A part of those technologies that have automated much of the historical domestic labour and thus led to the economic emancipation of women. A very small part and possibly not even an effective part but a part all the same. My own immediate thought on seeing the story was that Apple’s lawyers won’t be very happy about the name of it. They tend to be rather protective of people putting an “i” in front of anything even vaguely related to electronics.